Rifle, Colorado River Town and Energy Village strategic economic vision | Vandewalle & Associates, Inc.
Rifle Colorado is a rapidly growing western town located in an area where boom-and-bust cycles predominate, due to natural gas drilling and oil shale exploration. Vandewalle & Associates has been working with the City of Rifle Colorado and the Rifle Economic Development Corporation to devise sustainable economic positioning strategies—and implement key private sector partnerships—to bolster the community’s economy against these challenges. With the help of Vandewalle & Associates, Rifle was awareded a grant by the USDA to explore utilizing bio-based feedstock in the region for alternative energy and liquid fuel production. The Colorado Governor’s Energy Office and the Colorado Center for Biorefining and Biofuels (C2B2) has supported the City’s plan through letters of support and technical assistance. 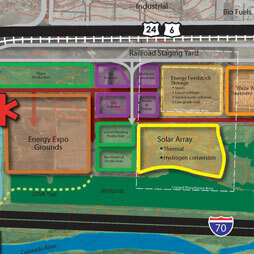 Private companies—from large energy groups operating in the region, to small start-up companies focusing on renewable energy technologies—have also expressed commitment to developing the Colorado Energy Innovation Center Campus in Rifle, for which plans are moving forward in earnest. The City of Rifle is defining its vision for the future as a “Steward of Energy” and is rapidly becoming a national model for energy and technology innovation.